A while back, I tried to standardize how I title my trip reports to make them easier to find and to use for anyone interested in trail details when they're planning their own trip. The syntax is generally "Activity Place: Trail Name." Anyone who's hiked in Pennsylvania, or read Bill Bryson's comments about Pennsylvania's section of the AT in A Walk in the Woods, knows we've got a few rocks here. I'm used to it, and even seek out rocky trails like the Pinnacle/Pulpit and Hawk Mountain because scrambling over boulders is fun. 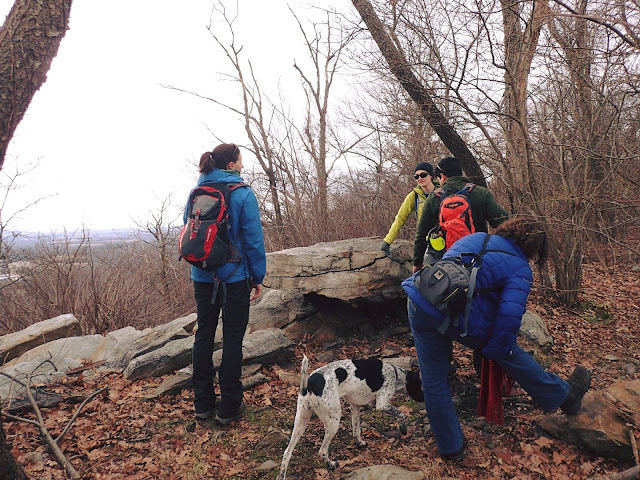 But this section of the AT, as friends and I discovered, is an entirely different ballgame. It took us about an hour and a half to get to the trailhead from downtown Philadelphia, and it was a piece of cake to find. Typing 40.860723, -75.292763 into your GPS will get you right to the parking lot. Then, we had to cross N Broadway, a relatively large street with fast-moving traffic, walk under the overpass, and pick up the AT. 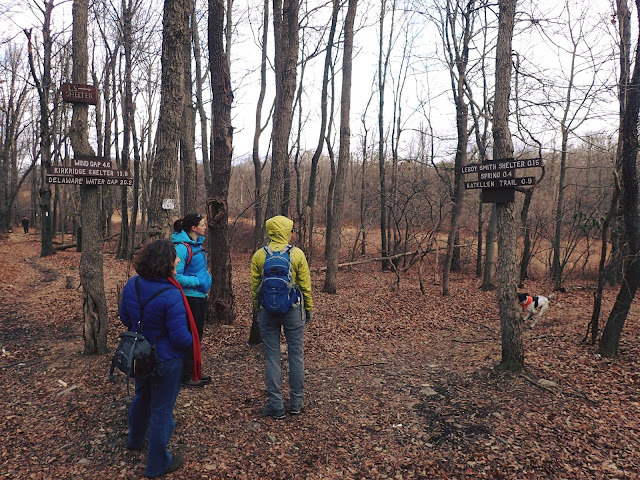 The AT itself crosses the road, but signage in the parking lot helps hikers determine which way to head from there. My friends and I chose this hike because it was a section of the AT none of us had done before, it had a clear turnaround spot that we thought would be perfect for lunch, and it was less than two hours from Philadelphia. Other trip reports made it clear the trail was going to be rocky, so I traded my Scarpa Ignite shoes for my Scarpa R-Evolution Plus hiking boots. I also hoped they'd keep my feet warmer, as temperatures were predicted to be in the 30-40ºF range. After we booked it across the street from the parking lot, finding and following the trail was a piece of cake. This section of the AT is well-blazed, as are other sections I've done, and some of the white blazes looked like they'd been painted on trees recently. 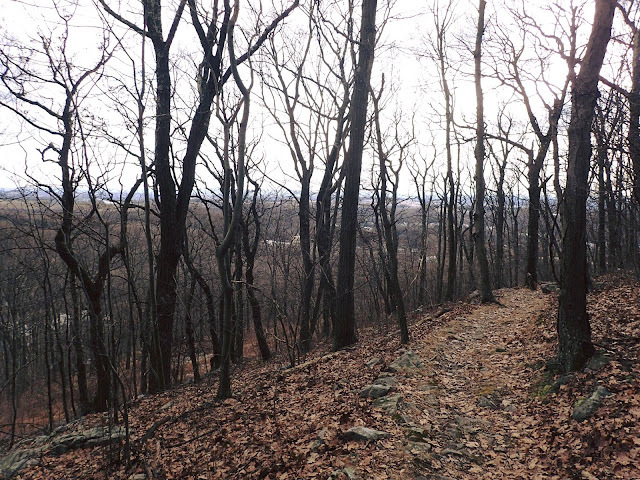 The trail started climbing immediately, and we followed switchbacks up Blue Mountain, peeking through the trees for views of Wind Gap and nearby rolling hills. Traffic noise was constant, given the trail's close proximity to PA 33. A mile or so into the hike, we reached the ridge, which we'd walk for the remainder of the route to the Leroy Smith Shelter. Traffic noise dissipated, and after we passed Hahn's Lookout, I started noticing how rocky it was. Some rocks were buried deep in the ground, but stuck up enough to trip you if you weren't careful, like menacing little icebergs. Others were big enough to stand on and walk on, but whether they'd move or shift under your feet was anyone's guess. After hiking in Pennsylvania since I moved here in 2007, rocks typically don't phase me. But the sheer number of iceberg-like rocks peppered between rocks big enough to stand on that moved, or didn't move, meant we were looking at our feet for the majority of the hike. When I'd see a stretch of trail that looked less rocky, I'd look up just long enough to stub my toe or trip. But it wasn't all bad. Breaks in the trees like Hahn's Lookout gave us a chance to look around, and given the chilly wintry weather (minus the snow), we had the trail to ourselves until we got to the shelter. Halfway along our route, around two miles in, we crossed a giant swath of open land. Trees had been cut to make way for an underground pipeline. Despite the giant scar on the landscape, the break in the trees gave us another chance to look around, as did the swath of land cleared to make room for power lines a mile and a half or so further along. After crossing under the power lines, we picked up a blue blazed trail that crossed under the power lines again, and led us to our turnaround point - the Leroy A. Smith Shelter. It was built 1972, has enough room for eight people to sleep, and has one of the most luxurious composting privies I've seen nearby. The privy features linoleum flooring, a bucket of sawdust to throw into the wooden toilet seat-covered hole when you're done, and a mailbox to hold extra toilet paper. We stopped for a quick snack, picked up some trash left behind by other hikers, and turned around to head back to the parking lot in Wind Gap. The hike took us about five hours and covered 8.4 miles. Take a look at our entire route here. Just in case it wasn't clear already, the trail is rocky; wear sturdy hiking boots. Given the number of rocks I kicked on this trail, I can't imagine how my toes would've fared without stiff-soled boots. And high boots will prevent you from rolling an ankle or two. Be cautious getting from the parking lot to the trailhead. The parking lot is big enough for ten cars by my estimation, but it's on the opposite side of the road from the hike described in this post. Traffic moves quickly on N Broadway; be sure to check for cars before you cross. Parts of this section of the AT are in close proximity to public hunting grounds. Be aware of whether or not hunting seasons are open when you're there, and wear orange. What do you think, would you have enjoyed this hike despite the terrain? What's the worst terrain you've ever hiked on? Have you done part of the AT, or all of it? We'd love to hear from you! Also, as a note, there are affiliate links in this post, and I'll receive a commission for purchases made.